How to estimate your siding cost? There are two main steps necessary to estimate your siding cost. The first involves measuring the surface area of your home, and the second is dependent upon which type of siding you will use. 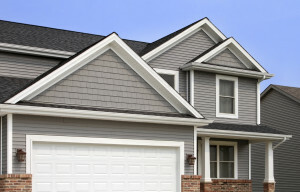 Exterior siding comes in a variety of materials, and some cost markedly less than others. Your best estimations will also need to take into account whether you’ll be siding your own home or hiring a contractor for the job. The shape of your home may complicate this step somewhat. Your wall area can be calculated by measuring each separate wall as a rectangle with a metal tape measure, and multiplying the height by the length. However, if your home has gables, you will need to isolate these triangles from the rectangular measurements and calculate them separately using the triangle area formula (height multiplied by length and the product divided by two). Then, add the square footage of each triangle and rectangle together to determine the overall surface of your home. If you are going to undertake the siding process yourself, then your costs really boil down to the purchase of materials and the tools necessary for executing this task. However, if you are hiring a contractor, these costs can be anywhere from double the price to, more likely, a triple cost. This is because you will be paying for labor, which varies amongst contractors. However, depending on which contractor you use, some may offer a discount on materials that depends on their relationship with the manufacturer. Truly, you may find that your siding estimates differ greatly from one contractor to another, which is why it is generally a good idea to consult with more than one company before making a commitment. It is easier to estimate the cost of siding installation than it is to determine the overall cost of your siding as a long term investment. This is because certain types of siding are less expensive to install but involve costly maintenance and repairs within a few years. These conditions represent expensive calls for imminent maintenance. When siding your home, it is very important to consider whether a reduction in up-front installation costs is worth the inconvenience and expense of future repairs. Such concerns should absolutely be factored into your siding estimate.